Laurier’s Brantford campus Homecoming takes place on Saturday, Oct. 22. 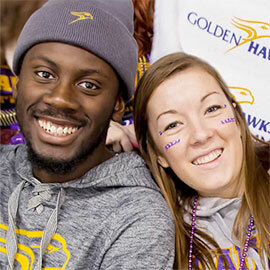 Homecoming is our chance to welcome our Laurier alumni home – and it’s their chance to reconnect with their former classmates, stay involved with the university, and to ignite their Golden Hawk pride. If you or a friend needs help, always ask for it: download the SAFEHawk app and contact Special Constables at 519.756.8228 x5762. Arrange a safe way home: use Foot Patrol 519.751.7875 (PTRL), call a taxi or use the Friend Walk feature in the SAFEHawk app. For those attending Saturday’s hockey game, please be careful when walking on city streets to and from the game. During the game, look out for your friends and respect your fellow fans. Brantford Police Service supports safe behaviours and the safety of our students and neighbourhood community. Police officers will be patrolling events.